This was the most fun event I’ve ever put together. 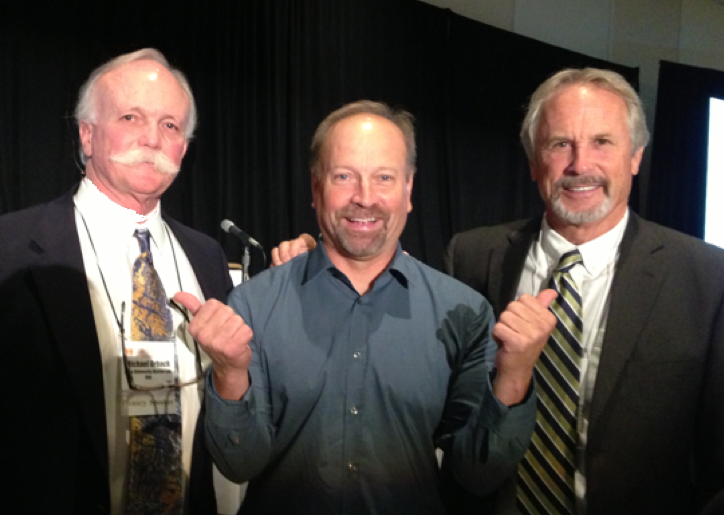 Big thanks to Steve Weisberg and the other folks at CERF. And don’t miss the first speaker in the Q&A, Ashley Booth, who spoke to the entire audience, saying, “I really appreciated that you guys brought this issue of narrative out. As scientists, we need to take a long hard look at ourselves and ask, ‘are we communicating this message as best we can? '” Bingo. 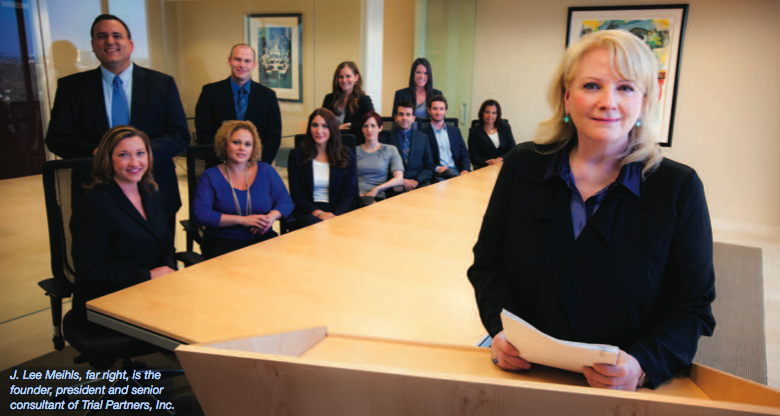 Video is a powerful tool with great potential for broad communication. But it’s not as simple as just gluing together a laundry list of facts. Sorry, but the IPCC just produced a video that is bo-ho-ho-ring. WHO DO THEY THINK THEY ARE REACHING WITH THIS? If it’s the general public, they will have lost them by 3 minutes in. If it’s scientists … why? They already know this stuff. This thing could have been 90 seconds and powerful. Instead it’s 7 minutes, but feels like 70. Maybe the subject matter (the fate of humanity) just isn’t very important to them so they don’t care. What is wrong with the people at the IPCC? How can they be so clueless about broad communication? I’m not the first one to ask this question. In 2008 my good friend John Sterman at M.I.T. published a wonderful short paper in Science in which he told about having math and science graduate students at M.I.T. regurgitate the basic message of the executive summary of the 2007 IPCC report. More than half got it wrong, showing that what was supposedly geared to the general public wasn’t even understandable enough for brilliant graduate students. 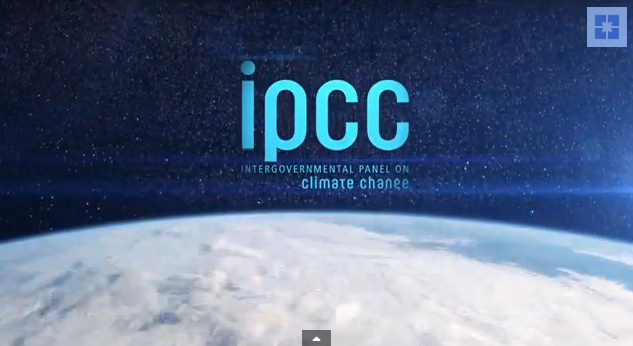 In a similar mode, the IPCC has just released the above video. I gave it 3.5 minutes, then hit the “life is too short” point and quit. As usual, at the core of the problem is the lack of good, tight narrative structure. But there’s more. It’s time for everyone communicating about global warming to use the Al Gore movie, “An Inconvenient Truth,” as your starting point. Anything presented in that movie you should assume that most of the public has now seen enough and move on from there. This was the basic rule I used a couple weeks ago for our successful Sea Level Rise panel at CERF. In working with the two speakers, I ruled out all their “shocking” slides of future flooding scenarios. Gore already did that in his movie — he had southern Florida and Manhattan. I did use images from the “Drown Your Town“ website for comic value, and Mike Orbach had the one futuristic piece of artwork of massively flooded Manhattan as part of his final summary. But we skipped the parts in the middle where you show the basic scenarios of projected flooded regions and the audience gasps on cue because they are expected to do so. Those images are no longer shocking. THE NARRATIVE HAS MOVED ON. The key factor is the need to “advance the narrative.” This is what narrative training instills in you — the feeling of, “okay, we already hit that note plenty, let’s move on.” I don’t think the makers of this IPCC video have “advancing the narrative” in their training yet. They should. Move it on, folks, you’re boring us. When Mike told me about the idea of sea level rise eventually reaching up to 100 miles inland by altering water tables causing groundwater contamination — THAT was when I came to life — THAT is an aspect of advancing the narrative — that is a factoid that wasn’t in the Gore movie and I think is likely to be new to most people, as well as fairly head turning. That’s what it’s about — tell us something we haven’t already heard a thousand times, and do it with some new imagery. Global warming is the most boring subject ever confronted by humanity. I firmly believe this. I was quoted saying it in 2010. Which doesn’t mean global warming should be ignored. To the contrary. It means it should be respected for how difficult it is to communicate, and the shear and utter intrinsic boringness of it should be accepted as the starting point — not ignored. Just because it is eventually life threatening does not make it interesting by definition. It just ain’t that easy. Anyhow, I was just interviewed about this by a magazine that asked me 10 questions about why I think this. The article should be out in the next week or so. I think it’s going to annoy a lot of the climate crowd (as usual). Ho hum. I’m tellin’ ya, it’s deep. The Logline Maker is like a looking glass. Download our CONNECTION STORYMAKER and embrace the complexity that resides in such a simple device. THE MASTER OF ELEMENT #2. 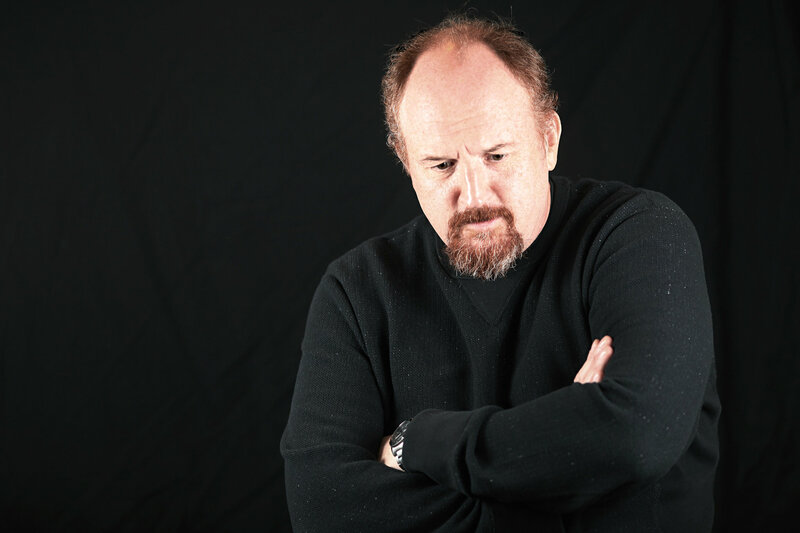 Wanna learn about the power of the Logline Maker — just listen to virtually any routine from Louis C.K. He lives his life running himself down — wanting you to know endlessly that he is a FLAWED protagonist (Element #2 of the Logline Maker). Just look at the first 5 quotes from him (and really pretty much ALL of them) in this list of 55 quotes. Just about every time he opens his mouth he is saying, “I am SO flawed.” And guess what, people love him. Not a coincidence. It’s #2 at work. Yes, the Logline Maker really is that powerful. It is the crystal ball of communication. You want simple — we give you the ABT. You want the infinite complexity of the human condition — we give you the Logline Maker. So there’s your simple, instant, “I get it,” broad communication tool. People learn the ABT in less than a minute and it has the power to be “transformative.” But it’s not like the Logline Maker. The Logline Maker is the whole shootin’ match. It is the entire cosmos in a single template. I’m increasingly thinking that no human is able to fully “grok” the true essence of the Logline Maker. Yes, it is that powerful. Just look where it came from — Joseph Campbell and George Lucas. Could it get any more profound than that in today’s world? We knew this as we wrote our new book Connection, but we’re getting to know it even more deeply each week with what we’re doing this fall. As far as we can tell, no one has ever assembled this sort of partnership of these two templates — the ABT and the Logline Maker. It’s not surprising we’re hitting these weekly revelations. Remember how Luke Skywalker had to learn patience in order to master “the force.” The Logline Maker is “the force” when it comes to broad communication. Joseph Campbell knew this. George Lucas figured it out from him. Now we’re slowly figuring out how to use it in teaching these core elements of broad communication. So the first thing we’ve come to realize is that anybody who just tosses out the elements of “The Hero’s Journey” without a great deal of delicate, cautious, thoughtful preparation for their students or workshop participants is basically doing the same as something like handing out iPhones to toddlers. That’s not to say that toddlers can’t pick up an iPhone and have fun and do a few useful things. But seriously … think about it. It’s the same deal. The Logline Maker is incredibly simple on the surface, but inside is as complex as an iPhone. More importantly, it needs to be presented slowly, thoughtfully, and probably with some baby steps first, such as the ABT. So that’s enough wonderment for today. You’re going to hear lots more as I continue this journey. But for now, here’s the revelation du jour: why do you think self-deprecation is such a good thing for a speaker? The answer is #2. The second element in the Logline Maker is the “FLAWED protagonist.” People love, love, love to hear stories about heros who have flaws. So that’s what is going on as Louis C.K. is explaining to you over and over and over again about what a dumbass he is. There might as well be a little flag over his head with a #2 on it and a bell going off each time he does it. It’s not just a quirky little thing that people love their protagonists to be flawed. It is fundamental. And takes a lot of absorbing to really grasp. And then you match that fondness up with the fact that science expects scientists to 100% flawless in the doing of science, you begin to see a possible communications disconnect. How’s that for flawed reasoning (but then wait, does that mean likeable reasoning)? MY FAVORITE PODCAST. Derek Colanduno and Robynn McCarthy are great hosts. This was my fourth time doing a podcast with Skepticality. Starting in 2006 I did one for Flock of Dodos, then Sizzle, then Don’t Be Such a Scientist. But this one is the best because it features a really funny guy (Brian) and a lovely actress (Dorie). The best part is the very end when Derek makes the comparison of simple communication to chess. Yes! That’s it. Bingo. It’s a fun discussion. Take two already-gifted speakers, add a guy with a new book on narrative structure, turn up the heat with an important topic like sea level rise, throw in 6 weeks of planning effort and conference calls, then put them in front of 1,000 people and you’ve got an event that works. All of which is a tribute to the brave vision of Megan Baliff, the organizer who came up with a crazy idea this past summer. A crazy idea that worked. That’s how it all started. My friend Megan Baliff contacted me in June asking me to be part of a “plenary panel” at CERF 2013 saying, “you’ll get to talk about your communications stuff in front of 1,000 people.” I was busy but thought why not and said sure. To make a very complicated story short, she assured me the two other panelists were wildly enthusiastic about the idea of me overturning their standard presentations and forcing them to do something they had never done before. She was wrong, they were definitely not psyched (can’t blame ’em), I sensed the whole thing would be too much work and too painful, so by early October I simply quit. But while I was on the phone with Megan, handing in my resignation and she was gracefully accepting it, honest to goodness, an email from one of the two guys popped up and it said they had discussed my crazy ideas, agreed they had both given enough successful presentations in their careers, they could afford one horribly embarrassing debacle, so they were ready to give it a shot. Amazing timing. The whole thing came that close to never happening. COMMUNICATING THE FUTURE. 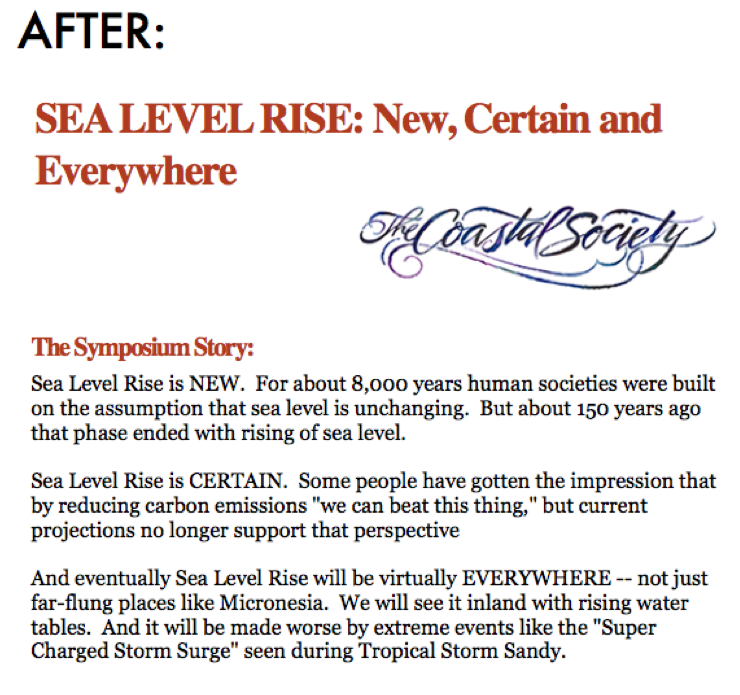 Sea level rise is “NEW” (after 8000 years of stability, the past 150 years now shows accelerating rising levels), “CERTAIN” (it’s gonna happen — nothing we can do now is going to stop it), and “EVERYWHERE” (not just the middle of the Pacific — it’s going to hit places considerably inland, even impacting groundwater dynamics in some inland areas). So here’s the sad and simple truth of communication. EVERYONE dreams of doing it well, but almost nobody wants to put in the time and resources needed. That’s pretty much the truth of it all. Institutions run communications workshops thinking, “we’ll give this communications stuff a day then everyone will be all set for eternity.” I swear, they really do. But it doesn’t work that way. It takes time and long term commitment. This is why we’re going with the term, “Narrative Training” to refer to what we are now advocating with our Connection Storymaking workshops. If you value effective communication, you have to INVEST in it. We certainly did for this event. We had an initial, obligatory conference call. I had to push the guys for a second one. But by the third week they began to realize we were concocting something challenging. That’s when the tide shifted. THEY began pushing ME to have more communication. I stopped having to push them. They started turning up the heat — saying look, if you’re going to throw us out in front of 1,000 people, we’d better get this thing smoothed out. But from the start it was destined for success because the two guys had so much material to draw from, plus they have such good communications instincts to begin with. The only thing they could use some help with, as is the case with absolutely EVERYONE in the ENTIRE WORLD, was narrative structure. This is why Hollywood movies are made by TEAMS of people. Not just one scientist sitting alone in his office organizing his slides. You HAVE to collaborate if you want to make the good stuff. From there the rest was a breeze. Once we had our three topics, it was just a matter of shaping their material into a solid template of, “1 – Perception, 2 – Reality, 3 – Communication, 4 – Humor.” For each of the three “stories” I helped them structure their material around this pattern, then we got on stage and they delivered the final ingredient — the performance. 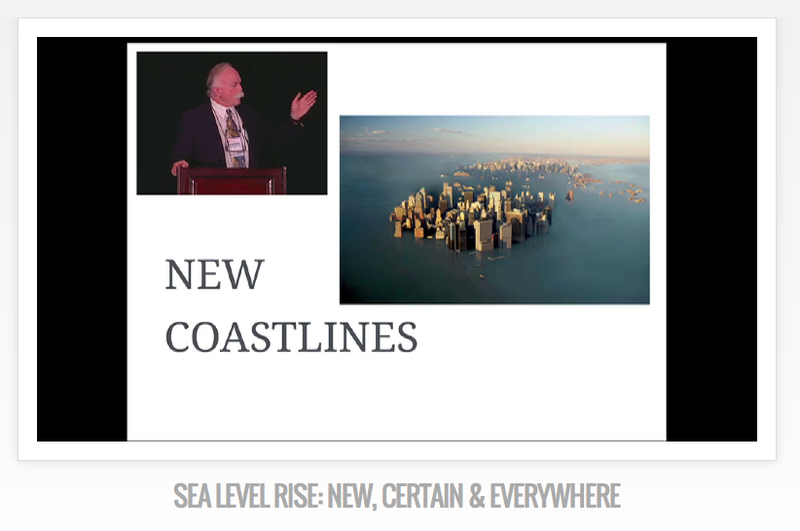 Gary came through with a lot of humor, Mike brought to bear his commanding oratorical presence, finishing the session with his list of four solemn recommendations on how we must start getting ready for sea level rise. It really was a tremendous event. I was just the host of the party. The two guys were the life of the party. Overall, it was a whole bunch of fun. And there was one more element which was our “crowd contributions.” Using the ABT template we had contributions from people around the country — from Alaska to California to Florida — including an amazing spontaneous performance from Nic Kinsman (a former student of Gary) talking about sea level rise problems in Alaskan coastal villages. And on the humor front, I interviewed Andrew David Thaler last week about his hilarious, “Drown Your Town” feature. He sent me some great samples to share with the crowd (thanks Jackie Yeary for initially telling me about his website) including the fact that of the first 1,000 people asking him to “drown towns” a third wanted to see Washington D.C. underwater because of the shutdown, plus they asked him to make the water brown. When we finished, the first person for the Q&A was a young woman who stepped up to the microphone, literally turned her back on us, then spoke to the entire crowd of a thousand. She said basically, “I know some of you may find this offensive, but we don’t need more science — what we need is effective communication like this.” It was such a wonderful and powerful endorsement that Gary asked me later if I had hired her — I had not (and by the way, the last time the first speaker in a Q&A turned their back on me it was the guy at Syracuse who told the 250 people in the audience, “This guy’s book is great, but this talk of his sucked” — but that’s a different story). It was a very gratifying experience. Mike, Gary and I went to dinner the evening before and kind of braced ourselves for the big experiment. No one felt certain the thing would work. But you know what, there’s a kind of excitement that comes from taking chances like that. Both of them absolved me of potential guilt — saying that even if it ended up as a mess, they were excited to just be trying something different. And in the end, all I can emphasize again is how much effort it took. There was very enthusiastic applause at the end and a whole crowd of people came up to the stage to rave about how much they enjoyed it. One of the organizers said he had taken part in probably two hundred panels over the years, but this one was the very best. Which was great. But let me just make it abundantly clear. I don’t think any of the three of us have put that much effort into a public presentation, ever before. I know I haven’t (and btw, back when I was a scientist I was notorious for, “organizing my slides on the plane”). So just ask yourself — how important is communication? That’s the bottom line. Here’s the “Before and After” of the event description on the CERF website over the past month — the initial description of the event before I was recruited, then the “makeover” the three of us gave it — adding “narrative structure” to the content. This is the exact goal of our new book, Connection: Hollywood Storytelling meets Critical Thinking — which by the way, Dorie, Brian and I discuss in detail in this great podcast with Skeptic Magazine that they posted yesterday. I spent 20 years searching Hollywood for them. Seriously. They are the best. 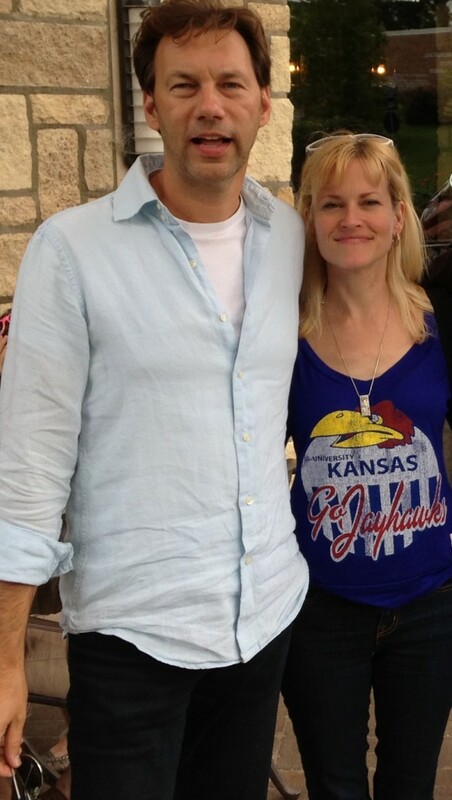 BRIAN PALERMO AND DORIE BARTON: She’s story, he’s improv. Dorie and I had a busy week in D.C. doing 4 talks in 3 days at AAAS, an EPA conference on their Children’s Environmental Health Centers, National Academy of Sciences, and then we ran a mini-version of our workshop at the Union of Concerned Scientists. In the meanwhile, Brian (who, like Dorie, is constantly either auditioning or performing in TV shows and movies) did an hour long appearance on a radio talk show on LA Talk Radio. He does SUCH a good job as our spokesman. I’ve known all along the guy is an amazing listener, but when I hear him regurgitating back things that Dorie and I present in the workshop I’m stunned — at times thinking, “I didn’t even know he was in the room for that.” Granted, he gets his philosophers a little mixed up (Kant and Heidigger versus Hegel), but then I gave Hegel the wrong first name in one of my talks in DC so nobody’s perfect. Since moving to LA 20 years ago I literally have met and worked with hundreds of actors. All the while I was looking for the few who actually have a curiosity about the world — enough to make them take an interest in my long term journey of exploring communication. These two turned out to be the best, and continue to get better. We have now done 8 workshops together. Each one builds on the last. One of the wildest things is watching Dorie and Brian change their perspective on the science world. Three years ago they didn’t even know how to make a Powerpoint slide or what “hooey” was (the acronym for Woods Hold Oceanographic Instititute, WHOI, pronounced hooey). Now Dorie knows words like, “stoichiometry,” and Brian routinely talks about ocean acidification and invasive species. 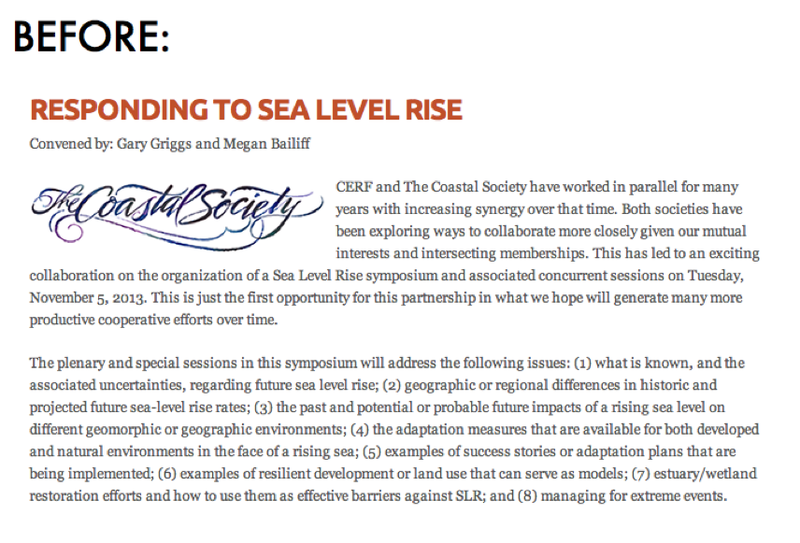 Next stop is next Tuesday morning, November 5, in San Diego at the CERF (Coastal and Estuarine Research Federation) meeting where I will be moderating this panel titled, “SEA LEVEL RISE: New, Certain and Everywhere,” with senior statesmen Gary Griggs (coastal geologist at UC Santa Cruz) and Mike Orbach (coastal policy professor at Duke University). We’ve spent the past month working diligently on the event — bringing a very cool narrative structure to it, unlike anything I’ve done before. 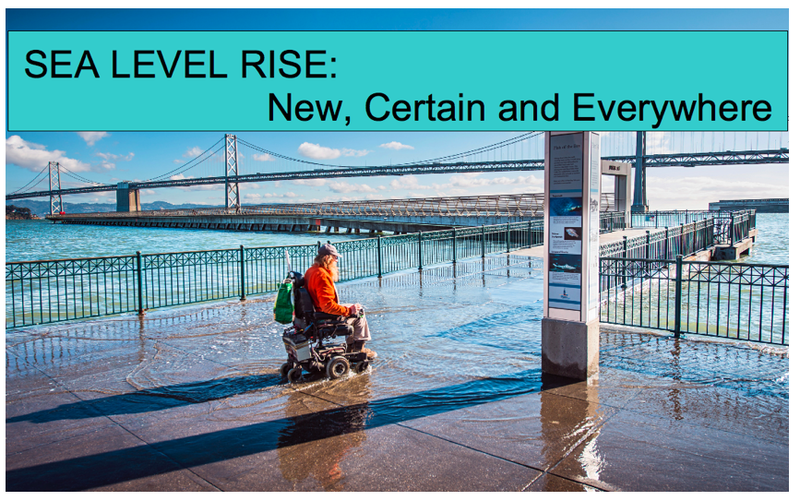 It will definitely be interesting and will provide a good overall snapshot of this issue of sea level rise today.